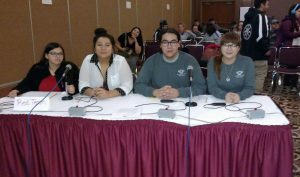 St. Joseph’s 3rd Place Finish at the 40th Annual LNI Knowledge Bowl! 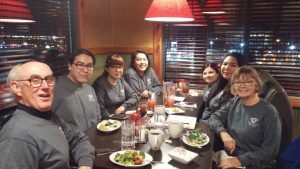 Our high school Lakota Nation Invitational Knowledge Bowl Team travelled to Rapid City, South Dakota on December 14th to compete in the 40th Anniversary of the Lakota Nation Invitational (LNI). With the expectation of a snow storm and below zero temperatures, we decided to head to the competition a day early and were able to beat the storm. 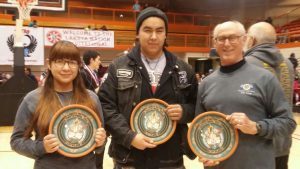 The next day, the storm worsened and halted travel for our Archery and Hand Games Team, who were still on campus at St. Joseph’s Indian School. This left our Knowledge Bowl Team as the sole representative of St. Joseph’s. 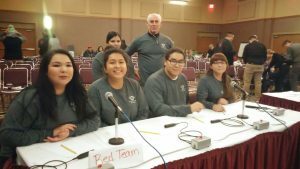 St. Joseph’s team- consisting of Lily, Justin, Danielle, Alyssa and Taelonna- began the competition with a ‘victory’ over Pierre Riggs High School on a forfeit, due to the declining weather conditions and their inability to make it to Rapid City. Our next match was with Pine Ridge, which we won convincingly. We started out tentative, but in the end won by a score of 9-2. The match against White River was intense from the git go. The competition was back and forth—we would take the lead and then White River would tie or surge ahead of us. At halftime, we had a slim lead of 10-8. With 10 minutes remaining in the match, White River took a commanding 19-13 lead. (They were either quicker at the buzzers or we just had more challenging questions. )With a brief timeout due to a challenge question by White River, we had about 3 minutes left to pull ahead in the match or we would reach the end of our tournament run. Suddenly, our team got hot and with Justin, Danielle and Lily answering all of the remaining questions correctly, we won 22-19 as the buzzer sounded! What joy, relief and jubilation—we were headed to the “Plate” Round (ceramic plates take the place of trophies at LNI). All we had to do was win 2 more matches and then we would be champions! As a team, we went out to Ruby Tuesday to celebrate (even though it was a Thursday J). The excitement and hopefulness for Friday morning’s competition set the tone. The students were excited as they planned their strategy. After dinner, we continued the celebration by going to the opening night movie, Star Wars: Rogue One. On Friday morning, the winter storm intensified to near-blizzard conditions. Temperatures were below zero as we drove to the Rapid City Convention Center to compete against Todd County, who were also undefeated at that time. The winner of this match would earn a spot in the championship round! The match against Todd County went back and forth, but we were able to pull into a 5-4 halftime lead. We were excited about our chances, but also very nervous since Todd County had won title a few years back. The second half began with Todd County taking a small lead, but we quickly caught up with them to tie the score. With a minute remaining, Todd County hit the buzzer before we did on a current events question and they won 14-11. We had a little bit of time to lick our wounds and prepare for the loser round which, with a win, would enable us to go back to the championship round. Next opponent: Custer! During the match with Custer, our intensity and stress levels began to rise, but we were on fire—taking a 11-5 halftime lead. After halftime, our nerves were settling—all we had to do is get some great questions and be super-fast on the buzzers. With only one minute left, we were down 19 to 16. To tie it up, all we needed were correct answers on one toss-up question (2 points) and the bonus question (1 point), which we had been doing an awesome job at all tournament long. The toss-up question asked was a current event question and we buzzed in quickly with the right answer! Now for the bonus question…but wait, a new judge said that we answered the question without being acknowledged by the moderator (rule 15), even though the moderator had already accepted the answer. We lost 19-16, but we did come in Third Place with a revered LNI Plate to take home. It was St. Joseph’s best showing at LNI since 2010!! Due to the continuing storm, our team waited until the next day to drive home when the winds and snow had abated. Though it remained 10 below zero as we journeyed on our three hour drive home, the excitement of a Third Place Team finish and two First Place Individual Plates kept us warm—it was St. Joseph’s strongest team ever! Congratulations on a tough job well done! Thanks Malinda! Blessings to you! Thanks Leslie! Blessings to you! Previous Previous post: Christmas and Basketball at St. Joseph’s Indian School! Next Next post: Random Happenings at St. Joseph’s!